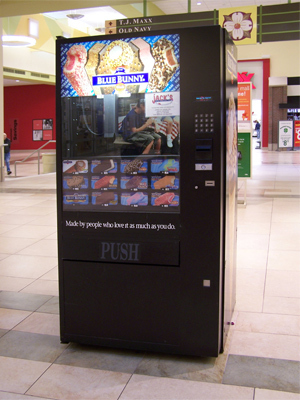 2001 brought the addition of ice cream vending machines to Jack's Ice Cream. Our 100+ machines can be found in local businesses, casinos, zoos, motels, etc. Our colorful vending machines provide a cool, rewarding treat for students, employees and / or customers. Prices range from $1.00 - $5.00 for quality Well's Blue Bunny pre-packaged novelties. Watching the machine in action is also a treat as you view the robotic arm moving to your selection, vacuuming it up and placing it in the serving tray. Our vending program allows our customers to provide Well's Blue Bunny ice cream novelties in a "no-hassle" environment. Interested in a machine for your high traffic location? Contact Us Today!